Rhubarb is pretty sour on its own, but made into a pie, it’s fabulous. April in Iowa is when rhubarb starts to make it’s appearance for the season. So, it’s the perfect time for making this pie. Mix the sugar, flour, and cinnamon in a large bowl. Add the rhubarb and stir well to coat. Set aside while you make your pie crust. Make your crust and roll out the bottom crust and fit into the pie pan. Pour in the rhubarb filling. Roll out the top crust. Either make a lattice crust or just a regular top crust. Put over the top of filling and seal to bottom crust. Moisten the top crust with milk and sprinkle with a little sugar- this is optional. 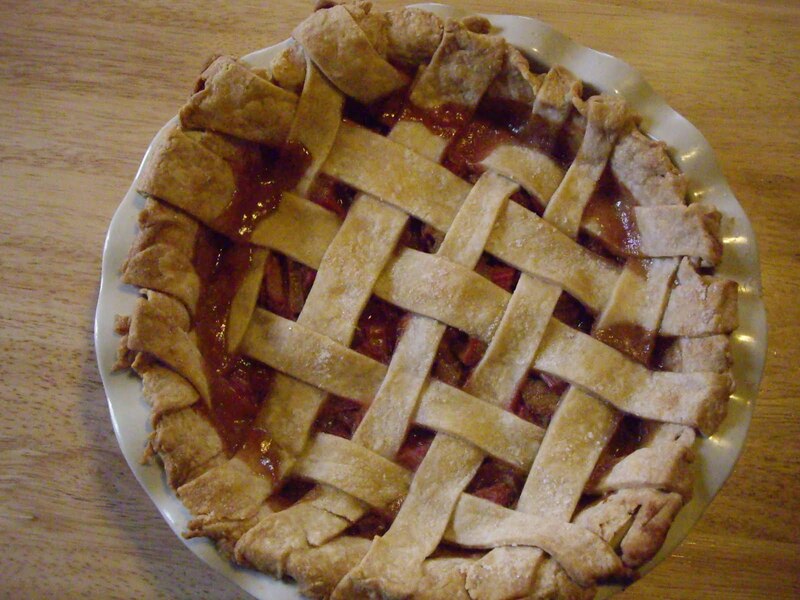 If you are using the lattice crust, it is ready to bake. If you have a regular top crust, make 5 slashes in the top to allow steam to escape. Cover the edge with a foil ring or pie shield to prevent overbrowning. Bake for 25 minutes for fresh fruit OR 50 minutes for frozen fruit. Bake another 20-30 minutes or until top is golden. The juices should be bubbling thickly through the lattice or slits. If your rhubarb is extremely juicy, add up to 2 Tablespoons more flour. TASTES AS GOOD AS IT LOOKS PEOPLE!